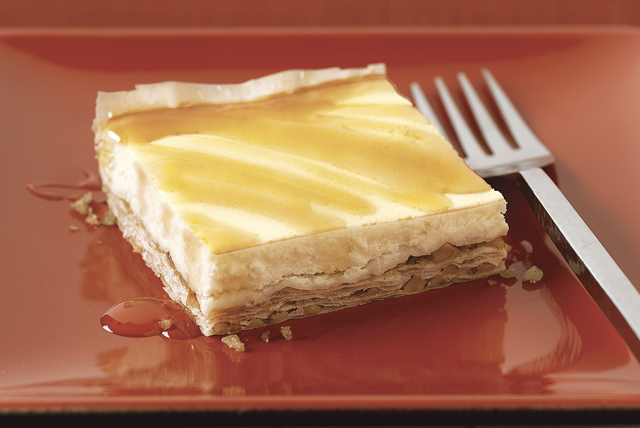 Combine cheesecake and baklava in our Sweet Cheese Baklava Recipe. Cinnamon, nutmeg and a honey drizzle make our Sweet Cheese Baklava Recipe unforgettable. Combine nuts, sugar and spices. Beat cream cheese, eggs, vanilla and 1/4 cup honey in large bowl with mixer until blended. Layer phyllo sheets in 13x9-inch pan, brushing each phyllo sheet with butter and sprinkling 1 rounded tablespoonful nut mixture evenly over every other phyllo sheet. Carefully spread cream cheese mixture over top of phyllo stack. Bake 25 to 30 min. or until cream cheese mixture is firm. Heat remaining honey; drizzle over baklava. Cool to room temperature before cutting to serve. Since this tasty recipe makes enough to serve 20, this version of a popular treat is sure to be a hit at your next holiday party. Keep phyllo sheets covered with a sheet of plastic wrap or parchment and a damp towel until ready to use. Use your food processor to process the nuts and sugar until nuts are finely chopped and mixture is well blended. Cover cooled baklava with plastic wrap, then refrigerate up to 2 days. For best flavor, let stand at room temperature about 30 min. before serving.